Wikipedia founder Jimmy Wales is speaking out against the attempt to extradite Richard O'Dwyer from the UK to the US. As we've been detailing over the past year, O'Dwyer ran a site called TVShack.net, that was a search engine for TV shows. It pointed people to the results, some of which were authorized -- and some of which were infringing. But, of course, a search engine should not reasonably be blamed for the results in points to. In fact, the admin of an extremely similar site in the UK, TV-Links, had faced criminal charges in the UK, but was found not guilty, because just linking to infringing content is not a crime. And yet... the US has pushed really hard to extradite O'Dwyer, and tragically, the UK has approved this charade. Given the thin case against him, it is an outrage that he is being extradited to the US to face felony charges. No US citizen has ever been brought to the UK for alleged criminal activity on US soil. There is a disparity here that ought to raise concerns at the highest levels of government in both the US and UK. From the beginning of the internet, we have seen a struggle between the interests of the "content industry" and the general public. Due to heavy lobbying and much money lavished on politicians, until very recently the content industry has won every battle. Internet users handed the industry its first major defeat earlier this year with the epic Sopa-Pipa protests over planned copyright laws that culminated in a widespread internet blackout and 10 million people contacting the US Congress to voice their opposition. O'Dwyer is the human face of that battle, and if he's extradited and convicted, he will bear the human cost. Wales has set up an online petition addressed to the UK government seeking to stop the extradition of O'Dwyer. Who knows if it will actually have any impact, but getting more people to speak out about this ridiculous overreach by ICE and the Justice Department would be a good thing. Well, this is unfortunate, though Facebook does have a history of somewhat arbitrarily deciding what you can and can't talk about. A few years ago, we noted that it had blocked any link to The Pirate Bay -- even if it had nothing to do with infringing material. A year later, we discovered an even more unfortunate situation, in that it wouldn't allow any mention of Power.com -- a company it was in a legal dispute with. However, it keeps getting worse. We've written multiple times about Richard O'Dwyer's fight to prevent being extradited to the US for running a site, TVshack.net, which links to TV shows -- some of which were infringing. As we noted, there are all sorts of important questions being discussed around this case, both about copyright law and the US's influence over UK courts. Apparently, Facebook doesn't want you discussing any of that. The Guardian's James Ball wrote an interesting article about how some UK politicians are fighting to stop the extradition. It's a good article. But, you won't find out about it on Facebook apparently. The story details how Tim Farron, president of the LibDems, in the UK has called the extradition approval "ludicrous" and has asked the government to reconsider. However, as James Losey discovered, Facebook won't let you post about it -- calling the article "spammy or unsafe." Specifically, it appears that (as with TPB) Facebook is blocking any and all mention of TVShack.net. However, Facebook's spam implementation is so stupidly programmed that it can't figure out that this is a story about TVShack.net in the well-respected Guardian newspaper, and not a direct link to TVShack.net. 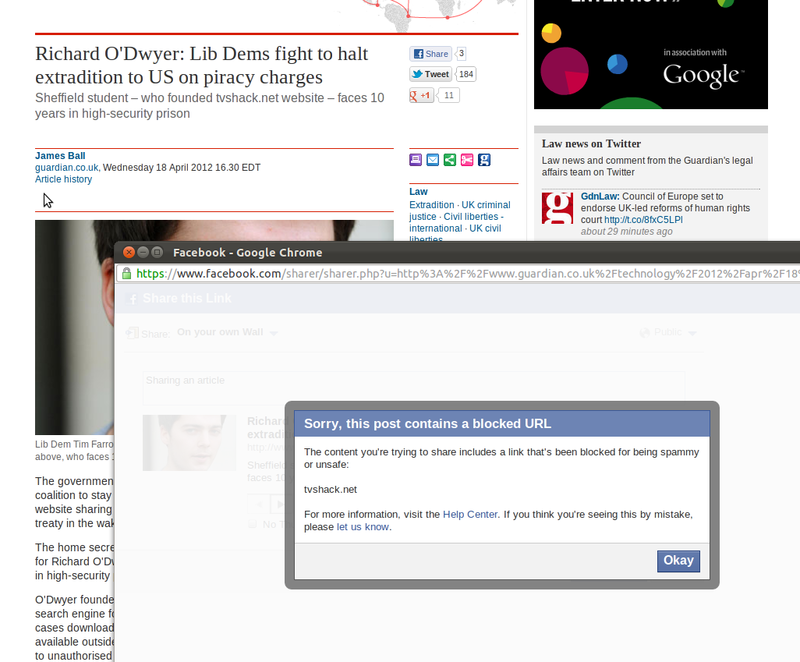 And, of course, merely linking to TVShack.net isn't against the law, so it's bizarre, obnoxious and stupid for Facebook to be blocking all such links in the first place. Finally, since the US government seized TVshack.net nearly two years ago, I don't think the site is really that unsafe any more, unless you don't trust the government to keep its server clean (which, actually, might be reasonable). Either way, shame on Facebook for hamfisted "filtering" which blocks important and legitimate discussions. Update: Facebook has fixed this particular issue, and now lets people post that story, but it's unclear what the overall rules are.